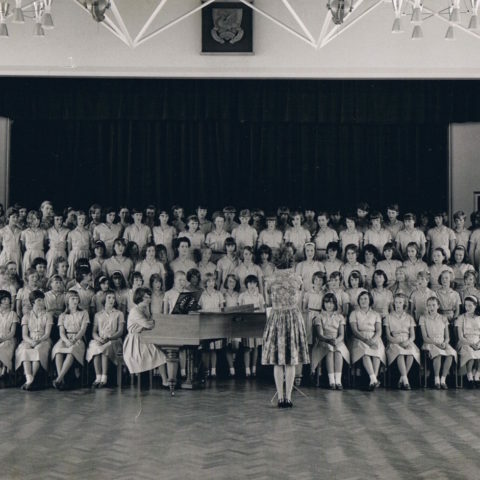 Thinking Through Sonorities in Histories of Schooling (2017) uses an unattributed photograph taken around 1964 to commemorate an audio recording the junior choir was about to make at the girls’ state secondary grammar school I attended as a pupil from 1958 to 1965. 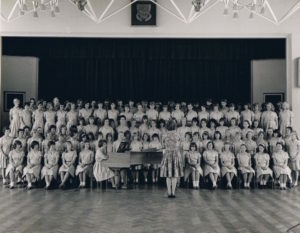 In the photograph I am documented visually as the girl seated at the piano. I use the photograph to explore research techniques for acoustic histories (see also Burke/Grosvenor 2011; Goodman 2017; Hoegaerts 2017; Verstraete 2017). I chart four techniques for reading the sonorities of the photograph that each draws on a different scholar’s approach to the acoustic, which I outline along with links to related pedagogies. Following Edwards’ (2012, 128) stress on photography as a sensorially integrated medium, each of the historians’ work I discuss inter-weaves the senses (sound/sight; sound/touch/sight; sound/hearing/touch/sight), while the fourth approach focuses more explicitly on sound as vibrating material. Rather than providing an in-depth analysis of the photograph, I am interested here in what aspects of sonority the scholar’s research technique brings to the fore. I then consider the various ‘ensoundings’ of the photograph through their implications for my positioning as researcher who is also girl-at-the-piano. I end by opening a line of thinking around change in histories of girls’ education that is prompted by thinking about the photograph acoustically. Goodman, Joyce. “Thinking through Sonorities in Histories of Schooling: Schulgeschichte Als Rekonstruktion Von Klangbildern.” IJHE Bildungsgeschichte/International Journal for the Historiography of Education, 7, no. 2 (2017): 277-88.